Two soldiers, including a junior army officer, were killed and and five others, including women and children, injured when a group of heavily-armed militants dressed in army fatigues stormed a military camp in Jammu in a pre-dawn attack on Saturday, hurling grenades and spraying automatic gunfire as they entered the family quarters when everyone was asleep, officials said. One terrorist has been killed so far, while two-three militants are still holed up.Five others were injured, including the daughter of the slain junior commissioned officer (JCO) who had come to visit her father during school holidays.Defence Ministry sources had earlier said the attack has been contained and the operation, which began 13 hours ago, is still in progress.The sources said that soldiers at the Sunjuwan Military Station close to Jammu city noticed suspicious movement near the camp around 4.45 a.m.Suspecting they could be militants, the soldiers challenged them. But the gunmen hurled grenades and opened fire from automatic weapons, the sources said. The militants then entered the JCO family quarters in the vicinity and holed themselves up in one of the houses. "The attack has now been contained. Most of the families have been evacuated from the junior commissioned officers quarters where the terrorists had entered. Before the final assault on the terrorists, we are making sure that no civilians are harmed in this operation," a statement said.Sources said room-to-room intervention was going on to pin down the militants inside the JCOs' residential building.Army sources said the terrorists have been pinned down and the operation is being carried forward cautiously so that no further security force or civilian casualties occur.There were intelligence inputs that Jaish-e-Muhammad (JeM) militants were planning to carry out an attack around the 5th death anniversary of Parliament attack convict, Afzal Guru, who was hanged on February 9, 2013 in Tihar Jail, the sources said. Para commandos of the army were airlifted from the army's Northern Command headquarters in Udhampur town to flush out the holed-up militants, believed to be three to four in number.The air force has been providing aerial surveillance to the security forces during the operation against the militants who have been surrounded inside one of the buildings.Union Home Minister Rajnath Singh, who spoke earlier to state director general of Police (DGP), S.P. Vaid told reporters in Delhi that security forces were doing their duties and there was no doubt that the operation would be taken to its logical conclusion.All educational institutions within half a kilometre radius of the camp have been shut down for the day.The attack on family quarters of military personnel was a stark reminder of a similar attack in 2002 when a group of militants in army fatigues killed 30 people and wounded nearly 50 in Kaluchak near Jammu. 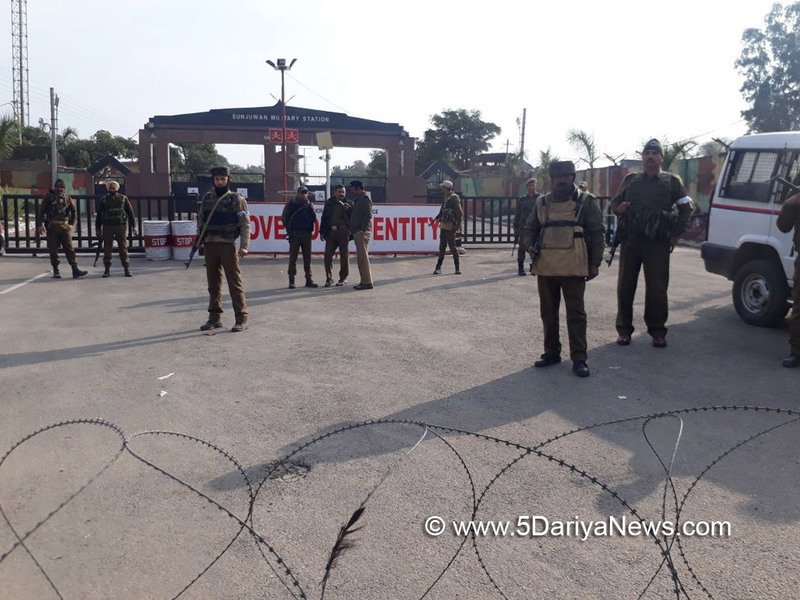 Jammu and Kashmir Speaker Kavinder Gupta visited the main gate of the army camp as the security forces carried out the anti-terror operation.In 2006, a suicide attack carried out at the Sunjuwan camp saw the death of 12 soldiers before two fidayeen militants were killed.Chief Minister Mehbooba Mufti expressed her anguish over the terror attack saying, "Deeply disturbed by the terrorist attack in #Sunjwan today. My heart goes out to the injured and their families. "NC working president and former Chief Minister, Omar Abdullah also condemned the attack saying, "News from Jammu & the encounter in #Sunjwan is extremely disturbing. Hoping for an end to the encounter without any loss of life among the security forces & their families."